following a written health and safety program helps to maintain a safe workplace as well as training employees in the safe handling of tools and materials to prevent work-related accidents and illness. Most theatre workplace training programs also cover the use and disposal of hazardous materials, which can be common in the prop shop, and the proper use of personal protective equipment (PPE) often used in completing work in the prop shop. Theatre companies are required to document and investigate all workplace accidents, near-accidents, and work-related illnesses. By doing so, they can correct the circumstances leading to workplace accidents and illness. The production manager, assisted by the area heads in each shop, commonly manages many written health and safety programs. It is the properties director's responsibility to advocate for health and safety compliance in the prop shop and the artisan’s responsibility to understand and follow the company’s policies for protecting them. At the start of each season, new employees and staff due for review or those being given new job assignments should be given appropriate training. In the prop shop, when a new product, tool or process presents a potential hazard, the prop staff should have appropriate training in handling, use, storage, disposal, etc as deemed relevant. Many companies keep written documentation in the employee's personnel files acknowledging the safety and health areas the employee have received training in to ensure compliance with safe work practices. These forms often require a signature of the employee as well as the trainer verifying what training happened and the date. An Employee Safety handbook is commonly used to help employees have a resource for questions about emergency procedures or other health and safety concerns. If the company utilizes a written handbook, it should be available in the prop shop as well as being given to each staff member upon employment. Running a safe shop starts with an investment in providing for a safe and healthy workplace. By demonstrating a commitment to the safety and well being of all shop workers and providing the appropriate personal protective equipment, the prop shop can be a safe and productive work environment. Having a long and healthy career in the theatre begins with each individuals commitment to safe working practices carried out on a daily basis. 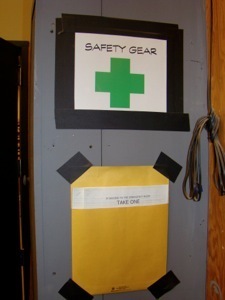 Each person working in the prop shop is responsible for personal safety. In the prop shop, this includes asking for assistance in completing projects requiring lifting or handling of awkward materials, cleaning up spills or contaminants immediately, wearing personal protective equipment such as gloves, safety glasses, respiratory protection, back support belts, etc as necessary, using approved ladders or step stools when climbing, and seeking out assistance or training when encountering a new process or working with a new product. Safe working practices for tool usage should be followed in consideration of the tool handler as well as others working nearby. Think about the process being done and what hazard might be created impacting the entire shop area as well as the workspace immediately present. Employees have the right to know the hazards associated with the products they are asked to work with and what safety procedures are required to protect them from exposure. They also have the right to question any instruction requiring them to disobey a safety rule, which endangers themselves or others, or if asked to perform a task which they have NOT been trained to safely perform. The law protects employees from retaliation for demanding their safety rights. If a staff member feels a problem exists they should work to resolve the problem. Verbal reporting of an immediate hazard to a supervisor or the properties director is best insuring the problem is resolved in a timely manner. Some shops utilize a safety suggestion form to report a continuing hazard or unsafe condition. Conditions requiring updating or maintenance to prevent a health or safety issue from developing can be reported using the form as well. The forms are generally submitted to production management or, in some companies, the safety committee, alerting the shop supervisor of the problem or to request janitorial / maintenance to fix the hazard. Review of safety suggestions also allows supervisors to advocate for possible changes in work practices or procedures, to suggest additional training needed, or to purchase protective devices or equipment. Working in the shop areas, artisans are exposed to a variety of tools and work processes. Being responsible for personal safety and caring for individual health and wellness is a primary work habit. As an individual works in the prop shop building a project, all others working around that person are also exposed to risk by inappropriate use of a tool, incorrect handling of materials or products, or poor judgment in a work process. Everyone in the shop is responsible for the safe keeping and good health of all shop workers. Keep an open eye to what others are doing and think through operation of equipment and use of materials in consideration of everyone who may be exposed to possible hazard. Click HERE to see example of tool orientation form. or by doing searches by specific area of interest. Many safety supply companies have helpful information, pamphlets, and written documentation on the safety products they sell and are willing to assist in the selection and procurement of safety materials and products. Lab Safety Supply provides helpful information on their website alongside the supplies and tools necessary to keep safe.